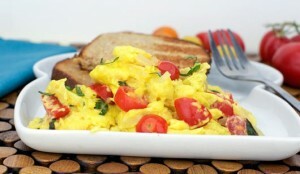 Scramble the egg with milk, salt and pepper and then pour the mix into a pan containing a spoon of butter. Stir the mix until it hardens. Spread the mixture in the toast and put a slice of Gouda cheese with a slice of tomato and pepper.